There are some scaling problems when running at resolutions above 1920x1080. 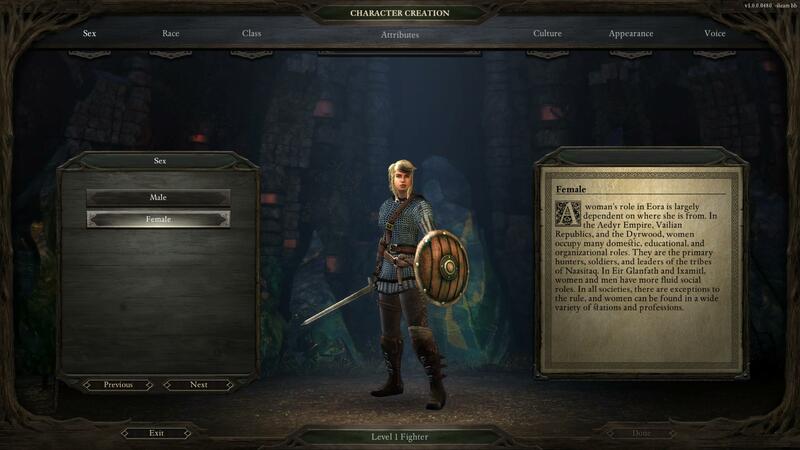 1) 3D models in character creation/levelup or inventory are scaled instead of rendered at the current resolution. The result is very blurry characters. 2) All text is similarly rendered at a low resolution and then scaled, instead of rendered properly. Results in pretty blurry text. Additionally, it would be nice to be able to zoom in further. Things get pretty small on 2560x1440, at 27". The 3D content should be rendered at the appropriate resolution. I'll ask Adam about it. I think we currently support increased levels of zoom through an .ini file. We may make this a menu option in-game. Positioning of elements being off are just bugs that need to be fixed. Thanks for giving us the specific examples. I think BMac is already looking at some of them. Bumping this, as while the loot stuff has been fixed (nice! ), all the other issues are still present. There are some black/background-colored bars going horizontally across the screen at a few points. 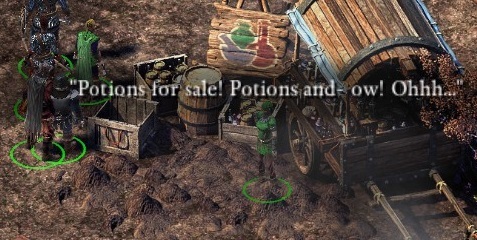 Have 3D models and font been fixed? At the very least those two things should always be crisp and not subject to blurry scaling. I bought my monitor with a 2560x1440 resolution because it had been said during the kickstarter that that would be PoE's native resolution. Pretty disappointed to learn that that is not case and I'm stuck with a blurry UI and zoomed out view. Not fixed in BB392 at least. Inventory paperdolls and character creation models are still upscaled rather than rendered at native rez. Default max zoom on the Mac build is past native rez; on the Windows build it is at native rez (i.e. pulled out further). All 3D items are currently "capped" at 1080p whereas they should always render at the target resolution. Font is similarly capped a becomes blurry past 1080p, whereas it should always be crisp at all resolutions (like it is in BG:EE, for example). UI gets really blurry past 1080p owing to a poor upscaling algorithm. Also would be good to have an official confirmation of the max. resolution past which 2D backdrops start getting smaller (was supposed to be 1440p during the Kickstarter). Huzzah! v435 has fixed the gui elements getting cut off! The upscaling issues are still present though. Seems unlikely they will be fixed for release. Maybe post-release patch? To be honest, the upscaling bit is really bumming me out. This is stuff I haven't seen since the days of early 3D, when some games were locked-resolution. edit: the programmers need to know that someone on the internet is OUTRAGED at this!!!!!!!!!!!!!!!!! I spoke with BMac about this in private as I, too, play at 2560x1440. He said they are aware of these issues and hope to get to them soon, so I am confident they will be fixed—it just might take a while as they're currently swamped in high priority bugs and optimizations. Oh nice, that's great to hear! And yeah, that's been my assumption too -- that there simply are a lot of things way more important than this. I jumped the gun a little in the excitement -- all 3D elements are rendered at full resolution now, but text (and UI art) is upscaled. Still fantastic to finally see the character models in all their detail! I appreciate the UI being 1920x1080 and the devs having no time to develop UI assets at 2560x1440, but we really need text to be sharp and not upscaled. Hopefully they can sort this out for release. 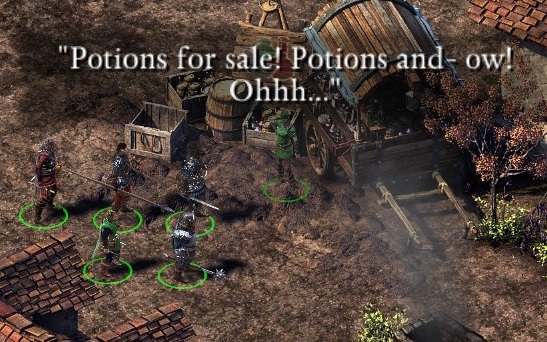 I'm hopeful that disabling the UI scaling completely is within the realm of moddability, so that even if the root of the problem doesn't get fixed any time soon, then at least the game will have resolution independence on a par with BG2. As it is, I'm not convinced I'm going to be able to bear playing with the text looking this bad, at least if there's as much text in the game as I'm expecting . Whoa, that text needs help. Devs, if you're reading this, please do something! I have the blurry font problem too (1440p screen, release build). Really annoying. Reducing UI scaling from 100 to 70 or 80 reduces the problem, but it is still quite a pain for my eyes. I will try running the game in 1080p (my screen might do a better upscale ! ), but I might as well wait for a patch to have the best possible experience with the game, as it is otherwise really cool !